The internet is entering a second era that’s based on blockchain. The last few decades brought us the internet of information. We are now witnessing the rise of the internet of value. Where the first era was sparked by a convergence of computing and communications technologies, this second era will be powered by a clever combination of cryptography, mathematics, software engineering and behavioural economics. It is blockchain technology, also called distributed ledger technology. 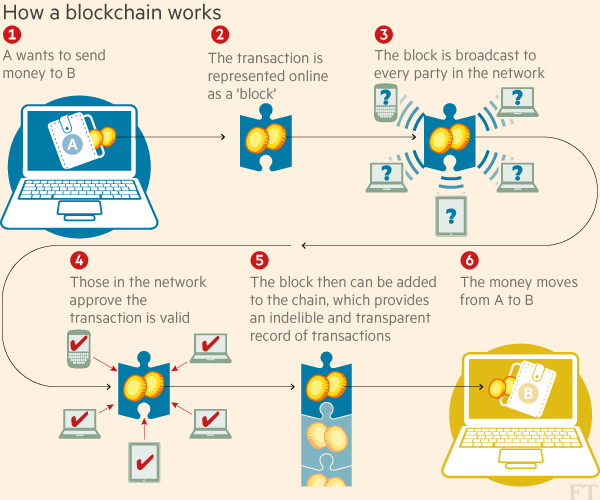 Like the internet before it, the blockchain promises to upend business models and disrupt industries. It is pushing us to challenge how we have structured society, defined value and rewarded participation. Blockchain emerged in the wake of the global economic crisis, when a pseudonymous person or persons named Satoshi Nakamoto released a new protocol for “A Peer-to-Peer Electronic Cash System” using a cryptocurrency called bitcoin. Cryptocurrencies (digital currencies) are different from traditional fiat currencies because no government issues or controls them. They’re not saved in a file somewhere; they’re represented by transactions recorded in a blockchain – like a global spreadsheet or ledger, which leverages the resources of a large peer-to-peer bitcoin network to verify and approve each bitcoin transaction. Satoshi’s protocol established a set of rules – in the form of distributed computations – that ensured the integrity of the data exchanged among billions of devices without going through a trusted third party. This new resource has six critical qualities. Each blockchain, like the one that uses bitcoin, is distributed: it runs on computers provided by volunteers around the world; there is no central database to hack or shut down. We can send money and soon any form of digitized value – from stocks and bonds to intellectual property, art, music and even votes – directly and safely between us without going through a bank, a credit-card company, PayPal or Western Union, social network, government or other middleman. Of course, this does not mean that middlemen will disappear. Rather the technology provides profound opportunities for innovative companies and institutions in the middle to streamline processes, increase their metabolism, create new value and enter new markets. Blockchain is encrypted: it uses heavy-duty encryption involving public and private keys (rather like the two-key system to access a safety deposit box) to maintain virtual security. We needn’t worry about the weak firewalls of the US Democratic National Party, or rogue bank employees. In many cases, blockchain is public: anyone can view it at any time because it resides on the network, not within a single institution charged with auditing transactions and keeping records. No one can hide a transaction, and that makes bitcoin more traceable than cash. It is open-source code: anyone can download it for free, run it and use it to develop new tools for managing transactions online. Private blockchains have emerged that don’t use cryptocurrency for consensus. Blockchain is, for the most part, inclusive. Satoshi imagined that the typical person would be interacting with the blockchain through what he called “simplified payment verification” mode that can work on a mobile device. Now anyone with a flip phone can participate in the global economy; no documentation is required to be trusted. Blockchain is immutable. Within minutes or even seconds, all the transactions conducted are verified, cleared and stored in a block that is linked to the preceding block, thereby creating a chain. Each block must refer to the preceding block to be valid. This structure permanently timestamps and stores exchanges of value, preventing anyone from altering the ledger. Blockchain is historical. If we wanted to steal a bitcoin, we’d have to rewrite a coin’s or asset’s entire history on the blockchain in broad daylight. So the blockchain is a distributed ledger representing a network consensus of every transaction that has ever occurred. Therefore, we must preserve the blockchain in its entirety. That’s why storage matters. This is much more than the financial services industry. Innovators are programming this new digital ledger to record anything of value to humankind – birth and death certificates, marriage licenses, deeds and titles of ownership, rights to intellectual property, educational degrees, financial accounts, medical history, insurance claims, citizenship and voting privileges, location of portable assets, provenance of food and diamonds, job recommendations and performance ratings, charitable donations tied to specific outcomes, employment contracts, managerial decision rights and anything else that we can express in code. So important is this new resource that some have called the blockchain a public utility like the internet, a utility that requires public support. Paul Brody, principal and global innovation leader of blockchain technology at Ernst & Young, thinks that all our appliances should donate their processing power to the upkeep of a blockchain: “Thanks to the smartphone business driving very low-cost systems, your lawnmower or dishwasher is going to come with a CPU that is probably a thousand times more powerful than it actually needs, so why not have the appliance mine? Not to make money, but to contribute to the security and viability of the blockchain as a whole,” he said. We’ve never had this capability before – trusted transactions directly between two or more total strangers, authenticated by mass collaboration and powered by collective self-interests, rather than by corporations motivated by profit or governments motivated by power. It is the culmination of what Alan Turning started, a true paradigm shift ushered in by decentralized ledger technologies. This is an extract from a whitepaper by Don Tapscott and Alex Tapscott : Realizing the Potential of Blockchain: A Multistakeholder Approach to the Stewardship of Blockchain and Cryptocurrencies. It argues that new kinds of cooperation are needed to govern Blockchain, and presents a framework for this.